Our first look at MSI X299 offerings arrived in the form of a mid-range board from the Arsenal Gaming series, the Tomahawk Arctic. 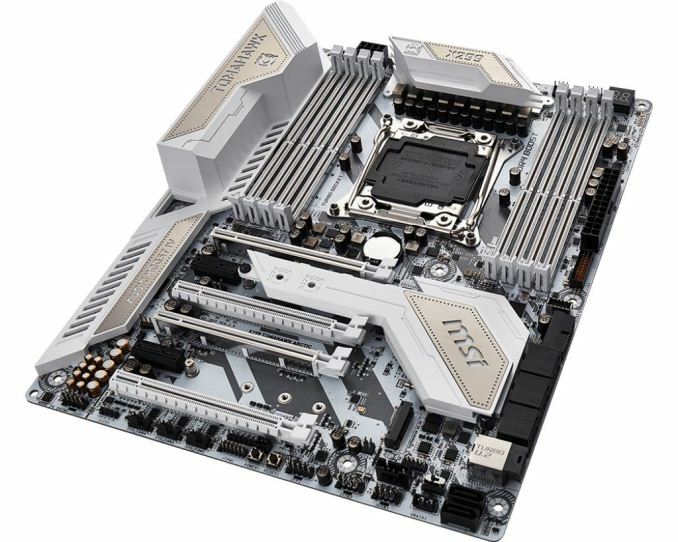 The Tomahawk line of motherboards, MSI says, have heavy plated heatsinks and "combative looks ready for anything". It uses MSI's branded 'Military Class VI' components and has features for gamers aimed to improve their gaming experience. 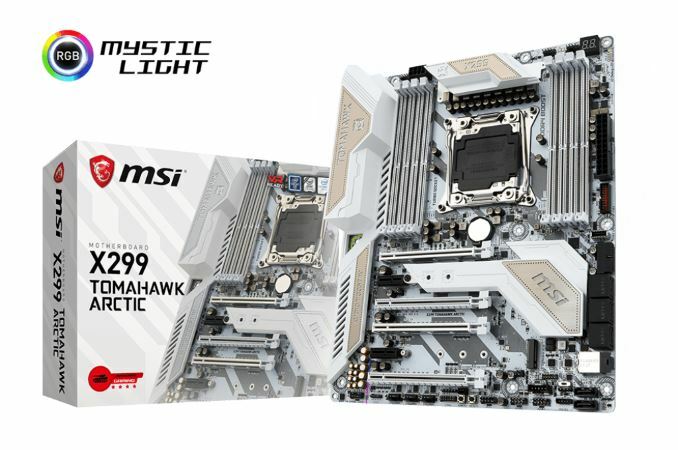 MSI brings a current total of 11 X299 boards to choose from: the MSI X299 XPower Gaming AC holds the flagship title and makes its home in the Enthusiast Gaming segment along with the X299 Gaming M7 ACK. There are a total of three boards in the Performance Gaming hierarchy in the X299 Gaming Pro Carbon AC, Gaming Pro Carbon, and X299M Gaming Pro Carbon AC (mATX). The Arsenal line carries the three Tomahawk boards, the X299 Tomahawk, the X299 Tomahawk Arctic (this review) and the X299 Tomahawk AC, while the Pro lineup for professionals has three motherboards; X299 SLI Plus (review soon! ), X299 Raider, and X299M-A Pro. The two mini-ITX versions are seemingly hard to find at this moment, in the US at least. There has been some excellent work done by Igor Wallossek over at Tom’s Hardware, with thermal probes, thermal cameras, and performance analysis. The bottom line is that motherboard vendors need to be careful when it comes to default settings (if MCT is enabled by default) and provide sufficient VRM cooling in all scenarios – either larger and heavier heatsinks or moving back to active cooling. This means there are going to be some X299 boards that perform normally, and some that underperform based on BIOS versions or design decisions. That's why (note not identical parts because it's a 12 core TR vs an 8 core i7 - but they are as close as I can get in terms of costs). If I went the other way and went with a 10 core i9 vs the 16 core TR then we see roughly the same pattern of behaviour. Threadripper wins in the multithreaded tests so long as the workload suits it but for the many benchmarks it's per-core speed which is more important than number of cores. In essence, if your work requires fast cores and quite a few threads then you're better off with the i7 or i9, if it utilizes loads of threads but speed is less important then you're better off with the TR.